Most people asked to name one British Second World War airplane would say the Spitfire. Yet the Hawker Hurricane flew in greater numbers, in more variants and in more theaters than the redoubtable Spitfire. Adrian Stewart has researched the evolution of the Hurricane from its 1935 maiden flight through to victory in the Far East in 1945. 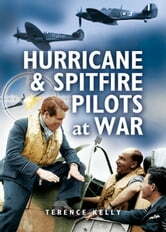 He brings his story alive by letting those who flew this legendary aircraft tell it as it was. After the faltering first steps in the mid 1930s the Hurricane really 'took off' and became hugely popular in the RAF and allied air forces. They Flew The Hurricane contains numerous first hand accounts from pilots operating in such diverse campaigns as the Battle of Britain, North Africa, Russia, the Far East and North West Europe from 1940 to 1945. These thrilling vignettes combine to bring to life action in the air.